Is your intuition telling you that your hypothyroidism or Hashimoto’s is causing your chronic pain? Let me show you how hypothyroidism causes chronic pain… but most importantly, let me help you learn how to fix it! Chronic pain in the setting of untreated Hypothyroidism or Hashimoto’s disease usually points to tissue level hypothyroidism. Tissue level hypothyroidism refers to the idea that you can have adequate levels of thyroid hormone floating around in your blood stream, but because of inflammation or other causes it isn’t able to get into the cells to turn on your genes. This is also known as Thyroid Resistance. And it is probably one of the most commonly missed thyroid conditions. Standard laboratory tests can only measure what is happening in the blood stream. We don’t care what’s happening in the blood stream because thyroid hormone has to get into cells to do its job! If you have adequate thyroid hormone floating around in the blood, but none of it can get into your cells, then you have what’s known as tissue level hypothyroidism. This is especially true if you’ve been diagnosed with Fibromyalgia. Chronic pain and Fibromyalgia accompany each other, however no one has been able make the connection as to how or why. Fortunately, there was a researcher named Dr. Lowe who put this all together for us. 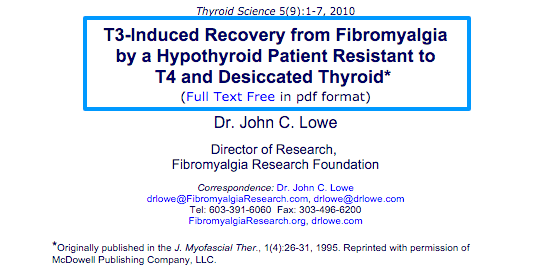 He linked tissue level hypothyroidism as one of the main causes of Fibromyalgia. And he did this through a concept known as ‘deductively formulated theory‘. This method of problem solving takes all of the competing theories that cause a disease and by the use of mathematical analysis pumps out the hypothesis that is most likely to be correct. (This is the same logic that Albert Einstein used to come up with his hypotheses – like the theory of relativity). He also showed that the majority of patients who fell into this category really needed some form of T3 therapy to have resolution of their symptoms. His data showed that approximately 2/3 of his patients improved on Natural Dessicated Thyroid Hormone (Medication like Armour thyroid, Westhroid and Naturethroid) and another 1/3 required higher doses of T3 only therapy(Liothyronine or sustained release T3). He found that the pain of fibromyalgia could only be reversed if patients were on a high enough dose of thyroid hormone (exact dosing is highly variable andindividualized). How do you know if you have Tissue level Hypothyroidism? Unfortunately testing blood levels of thyroid hormone are not 100% accurate. As a result it’s best to use a combination of serum markers as well as Physical exam findings and subjective symptoms to diagnose tissue level hypothyroidism. Thyroid hormone is involved in the production of Dopamine. If you have low levels of thyroid hormone you will have low levels of Dopamine which will result in the symptom of Chronic Fatigue. Thyroid hormone helps your body convert Tyrosine to Dopamine, Norepinephrine and Epinephrine. You may know some of these hormones as “adrenaline” which helps to set the metabolism of your body and is required for the “fight or flight” response. Under normal circumstances thyroid hormone helps your body burn fat by increasing the effectiveness of lipolytic enzymes (enzymes that break down fat). When thyroid hormone is low, these enzymes are also low resulting in the inability to break down fat molecules – making it almost impossible to lose weight. It is well known that thyroid hormone is required for both hair growth and proper pigmentation. When there isn’t enough thyroid hormone in the body not only will you be unable to grow new hair, you will also be unable to absorb nutrients required for hair growth (like zinc) which will lead to further hair loss in a vicious cycle. In order for muscles to relax your body must produce ATP (the energy currency in your body). Thyroid hormone is responsible for this energy production and when you have low thyroid you have low energy production. This inability to relax your muscles results in trigger point formation and muscle tension/pain. One of the most sensitive markers for tissue level hypothyroidism is this physical exam finding. When tissue levels of thyroid are low it results in the inability of your muscles to relax quickly which causes a slow relaxation phase when checking deep tendon reflexes (Deep tendon reflexes is what happens when your Doctor hits your knee with his reflex hammer). If you are suffering from any of these symptoms, plus chronic pain or you have been diagnosed with fibromyalgia – there is a chance you may have tissue level hypothyroidism! What can you do to Treat Tissue Level Hypothyroidism? Dr. Lowe created a treatment regimen which allowed him to have complete remission of symptoms in patients with fibromyalgia and chronic pain. Getting on the right dose and type of thyroid medication (most people with chronic pain will need some form of T3 therapy – like NDT or liothyronine). Exercising to tolerance – This means exercising to maximum intensity. Even if that means jogging down the street for 10 seconds! You must be placing physiologic demand on your body to change your genes and balance hormone levels. Real, whole food, Nutritious Diet – Avoid highly processed foods and focus on fruits and veggies (AKA “real food”). If it has a food label or more than 1 ingredient – leave it out. You can read more about my 10 Day Thyroid Reset Diet here or learn about finding the best Hashimoto’s diet for you here. 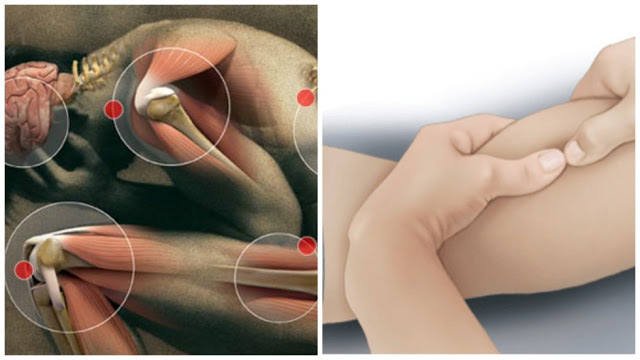 Trigger point therapy – Either by massage or through trigger point injections. In order to reduce pain these points MUST be taken care of otherwise they will potentiate further pain and muscle spasm. Replacement of Nutritional Deficiencies – Most commonly being high doses of B complex vitamins, Zinc, andIron. But remember, deficiencies are highly variable so get tested! Quick Tip: Remember that lab tests are not the best way to diagnose Tissue Level Hypothyroidism. Focus on a combination of lab tests, subjective symptoms, basal body temperature and metabolic function for diagnosis and management. You can learn how to diagnose and manage your thyroid here. How did you overcome your Chronic Pain, did it improve when you changed medications? What dose and type of medication are you on that’s working for you? Leave your comments below so we can help people get out of pain! Original article and credits: restartmed.com.